The 'slim style' Li series three was the start of a long production run and almost all future large frame models were an evolution of the Li series 3. 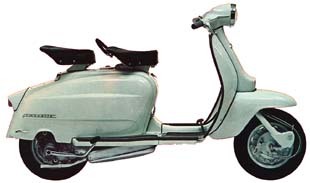 The Li 3, was a great sixties design, and a lot of the advertising for the scooter used sixties model and icon Jane Mansfield, either sitting or standing on the Li. The body and panel work itself was all new in design, slimmer and sleeker, than the series two it replaced. New headlight, horn cast, slimmer leg shields, panels, rear running boards all helped make the 'slim style' look, well slimmer! Twin single saddle seats were fitted as standard on these machines, although the single dual seat was available as an option should you wish. The new Series three models gained rear frame badges in holders rather then the earlier models fake grilles. These badges wore the model, either Li125 or Li150. Under the panels technical details mostly stayed the same, although a number of minor changes were made cosmetically. A new carburettor, SH18, featured the float chamber built in under neath the carb instead of the earlier MA/MB side float chamber items. This carburettor gave not only increased miles per gallon, but also helped to increase the overall speed of the new Li. The bulbous kick start stop bulge was dropped from the S1/2 in favour of a more streamlined chain casing. Due to the slimness of the body and floor boards, a kick start pedal with less of a kink out was utilised. Carburettor hose, although retaining the looks of the earlier models did now not need to be as long to bridge the gap between the air box elbow and carburettor. The air box was also given a slight overhaul, slimmer and with a redesigned metal neck and air filter cartridge retaining system. A more boxy exhaust box, with seperate U bend up to the cylinder was fitted with replaced the box and seperate tail pipe & u bend on previous models. All UK models came with a battery which provided power for the parking lights, which was a legal requirement for UK vehicles at that time. The battery also provided power for the horn and stop light. 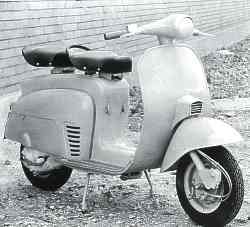 All other markets received the same direct lighting system that was more common to the Lambretta. The front suspension was still the same Innocenti design with trailing links sat on buffers, but slightly differing in shape, and thinner. Rear suspension again remained the same coil damper unit combined as on previous models although the was now half an inch shorter. Braking received slight cosmetic changes, and remained drum front and rear. The locking tab washer on the rear hub now sat in a recess in the hub itself, which also gained an extra hole taking the total up to three to allow easier fixing of the locking ring. The rear hub was tightened to its torque setting of 150lbs but the choice of three holes for the locating screw made for easier fixing at the factory torque setting. With a production so long, in fact the longest of any model, many mid run production changes were made. Early Series 3 Li's used four pole stators which carried over from the second series, later models switched to the to six pole system which used more lighting coils to give better electrics. Gearbox ratios were changed on the 125 models to improve speed. With the changes of new and existing models that were made, so the Li models received them as well. In 1965 the chrome ring underneath the headset was deleted, the gap left by that being taken up by a deeper headset base casting. In 1967 Innocenti produced a batch of Li 125 models that have now found themselves steeped in a bit of mystery. It is not known why approximatetly 1400 of these models were made, it can only be guessed that they were built in order to fulfil a specific order. On first appearences the Li S4 appears to be a "normal" Li, but on closer inspection the subtle changes can be seen. Gone were the bolt in fork buffers to be replaced by the push in type favoured on other machines at the time, side panels were the clip on type and not the normal handle type. The horn cast crest badge was replaced by an alloy silver coloured badge, with Innocenti wording on a centre blue back ground. Rear frame badge was changed from the Li 125 one as seen before, to the Lambretta Innocenti type as fitted on SX models. Underneath the side panels, the grey plastic tool boxes were fitted. Paint colour wise, it is thought the Li 4 was only ever offered in the pale blue (8070) colour. As far as it is known, no advertising material was ever produced for this model, hence it is assumed they were built for a specific order. Frame numbers were even changed to read 125Li4. All in all with its long production run, low costs, and evolution of parts used and fitted the Li series 3 was a commercial success for Innocenti. 143,091 150c models were made, and 146,734 125cc models left the Innocenti factory gates.